What really steals the show though are the Stormcast riding atop them. From what I have heard, Chris used really gold flakes in the paint to give it such a shiny and realistic look. I have honestly never seen such realistic looking gold on a miniature before. 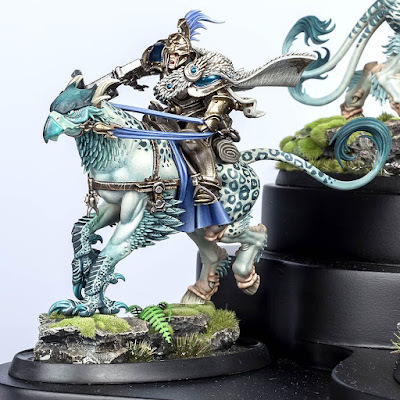 The fact that he has also painted the blue areas on the armor as metallic just further reinforces the idea that it's all made out of real metal. 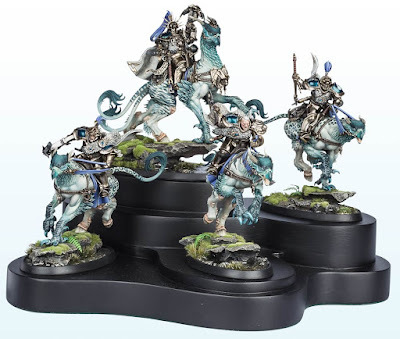 Everything on these Palladors is just fantastic, and in my opinion, paint jobs like this really help to ground the more fantastical elements of AoS into a real world. I love super fantasy paint jobs as well, it's just nice to see something so realistic sometimes.